Jesus Christ (the head of the church) appoints leadership within His congregations. The church is the body of Christ, and the church is all those institutions which constitute as believers of Jesus Christ (despite of denomination). Our God is a God of order. He sets boundaries, protocols and principles so that the church could effectively function. The church is God operating on the earth, on behalf of God. The words deacons, elders and overseers basically mean ‘servants in leadership’. The first deacons were chosen by the church, and the apostles charged them with different ministries. In the scriptures, the elders (or deacons) fulfilled the worldly tasks, in order for pastors to attend to the study of the word and prayer. The Lord God appoints those in leadership to help others in higher positions balance their lives accordingly. We all need support, and the church organization is no different than big corporation and government institutions. The US government for example, has a head, and different branches of help. The president of a nation, cannot do different functions at the same time even though he is the head of the country: he cannot physically fight in wars and also sign off legislature. Paul tells Timothy that whoever aspires to be a leader within the church walls, desires a noble task. And Peter wrote in his letters that God holds leaders accountable, for the spiritual well being of those we are leading so this responsibility should not be taken lightly. 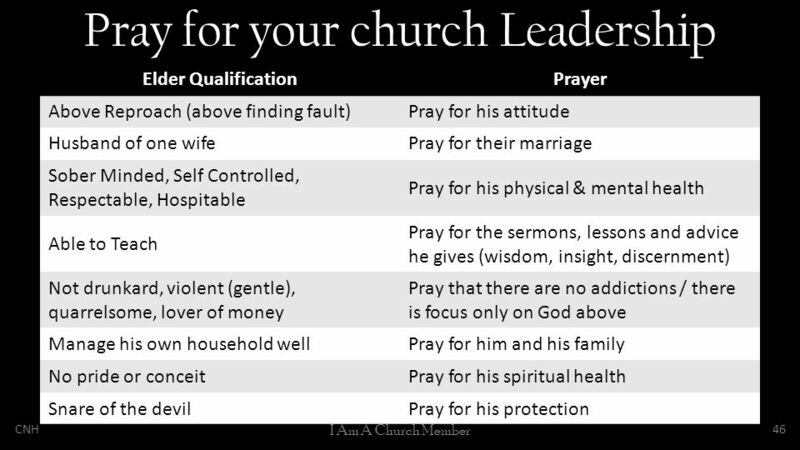 As the saints, or the flock of the pastor: it is in our responsibility to pray, submit, support and follow our pastors and leaders (especially, when we are leaders ourselves). Now more than ever we need to cover our church leaders, so that we are not led astray as many people are. Lord Jesus, thank you for your faithfulness and love. Thank you for your mercy and forgiveness, and thank you for your correction and rebuke. I come before you to ask you for a praying spirit to come upon all of us, the church of Jesus Christ. I pray that we are not those who will be found faithless, or love less when You return. May we not be those who are wrinkled or blemished. May we be people of reverence and of character. May we be intercessors, laying down our lives for our brothers and sisters in Christ. In the most holy name, of Jesus, do I pray. Amen.